When looking for affordable services in the Kingdom of Thailand, it is important to look for integrity and a company where the client service is always at the forefront With this in mind, RWT International Law Offices is proud to create “ The Work Permit/Visa Services Educational Initiative” where our focus is in providing schools of any size in the Kingdom of Thailand with the same high level of service from an acclaimed International firm but with HIGHLY DISCOUNTED RATES. These unmatched services and prices will provide your budget with the extra flexibility it needs in these tight fiscal years ahead and we will also include your small business too. Just take a look at your current services including the quality and price of your current work permit/visa services then give us a call or email. Please let us tell you how we may be able to provide any additional yet mutually beneficial option to you, thereby decreasing costs for your school and providing proactive, reliable as well as cost-efficient services to both your school and community. We know your time is precious and limited but wanted to share that RWT is highly regarded in both the Thai and International community with a wide variety of international clients while also proudly providing cultural diversity within our workplace. We have also been an active member of the BCCT, AMCHAM, German, and Singaporean Chambers, and as such have contributed to furthering the educations of many students around Thailand and Worldwide thru our own charitable works, we provide such students the means for higher education here in Thailand and abroad. We also offer our assistance to the educational community as a whole while by providing real life situational internships in our firm for those seeking higher aspirations in Law/Accounting/Paralegal/ Business Management. Our Immigration Division has years of practical experience in the Education field and have worked in schools and higher learning institutions here in Thailand, and so because of that we are delighted to offer some the most highly discounted rates for work permit/visa services provided by our highly motivated team of proactive and fast-acting personnel. This and our SBA Accounting Services Division provide numerous mutually beneficial options available to you right within your fingertips. At RWT, we are a boutique firm which provides flexibility and a highly motivated team of experienced professionals while using the highest standards in integrity and confidentiality as well as the most culturally diverse firm of its kind in Thailand. I have attached just some of our work permit and visa services we provide and can find the best solution for all of your legal needs. The reason our firm has doubled in size over the past two years is that we still stand by our goal by providing premium proactive services with cost-efficient programs. Conveniently located just above Phrom Phong BTS station at Emquartier in the 32nd floor of BHIRAJ Tower, our full-service law firm handles clients worldwide and includes multiple industries and companies here in Thailand. Our firm also represents one of the most Culturally Diverse firms in all of Thailand. 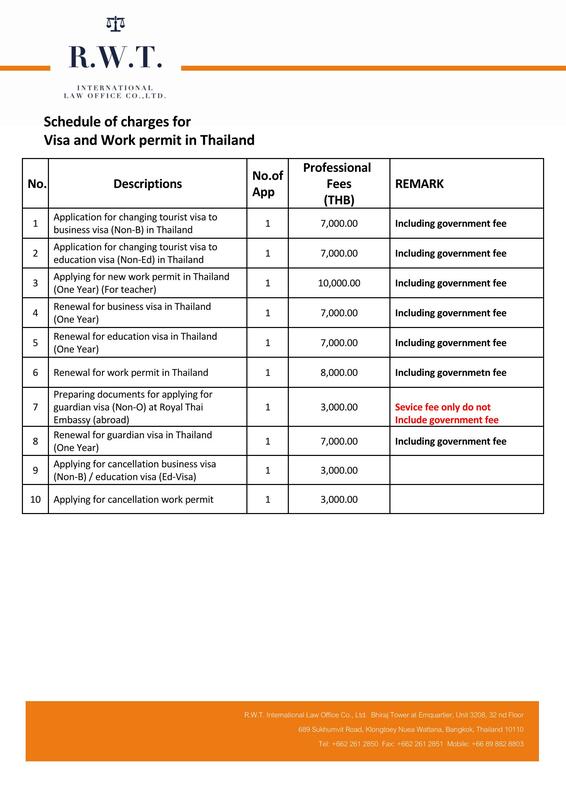 Please feel free to email our Work Permit/ Visa Services Director (Khun Tor) Thidasawan Baothonglor at thidasawan.b@rwtlaw.co.th or call us at (02 2612850) for more information.